Hello ... Hello ... my old friends ... It's great to see you once again! 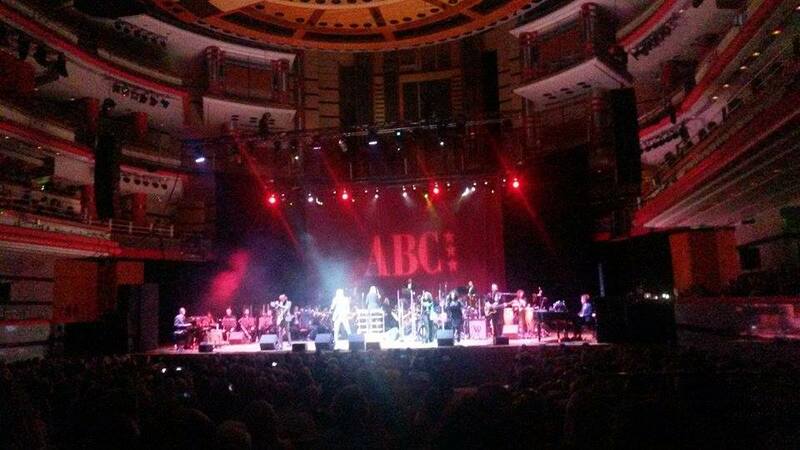 ABC have "Absolutely" nothing to do with ELO but they are one of my other fave bands. 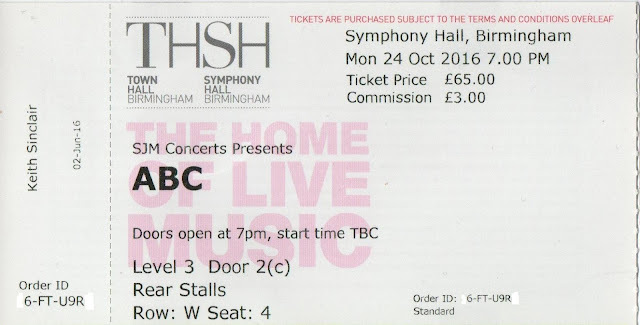 And if Yours Truly KJS was thrilled to see them live for the first time last November, then this concert - in the same venue and also backed with a full orchestra - was not to be missed. And so it was last night (Monday 24th October) as Martin Fry and his impressive ABC troupe contrived to deliver an astounding gig at Birmingham's fantastic Symphony Hall, ably assisted by Anne Dudley conducting The Southbank Sinfonia. And yet there was an ELO connection on the night "After All" as the ultra-talented Rob Fusari included a sample from "Concerto For A Rainy Day" during his entertaining and energetic preamble to the arrival on stage of Sheffield's finest! Everywhere I go, there is always something ELO! Then came Martin Fry and ABC. Basking in the Top 5 success of "The Lexicon Of Love II" (see the elobf album review here) and relishing the buoyant full house, their first set involved a slick selection of songs from the new album sandwiched between opener "When Smokey Sings" and "The Night You Murdered Love". New tracks including lead single "Viva Love", "The Flames Of Desire", "Ten Below Zero", "The Love Inside The Love", "Singer Not The Song" and my fave "Confessions Of A Fool" were completely at home - and thoroughly ABC - within their lavish orchestral surroundings. The interval only served to further excite the 2,200 audience as that anticipation was rewarded with an accurate and inspired rendition of their 1982 bestselling debut produced originally, of course, by Trevor Horn. I've been to many gigs at this venue and, in all honesty, I've never seen an audience react, dance and sing the way this one did as - from "Show Me" to "The Look Of Love (Part Four)" via "Poison Arrow", "Date Stamp", "All Of My Heart" and two performances of "The Look Of Love" - Martin Fry, ABC, Anne Dudley and The Southbank Sinfonia recreated this memorable note perfect live spectacle celebrating the timelessness and class of "The Lexicon Of Love". It was dream come true for this particular fan of the stringed excellence of both ABC and ELO, alphabetically speaking, of course! elobeatlesforever (elobf) recommend ABC, The Southbank Sinfonia and Rob Fusari to those enlightened folks who enjoy the music of ELO, Jeff Lynne, The Move, Roy Wood, The Idle Race, 'Brum Beat', The Beatles and related artistes.